Today’s subject – once again – is the FSC Controlled Wood system. A major transition is underway in the community of FSC-certified companies. The long-awaited transition from FSC-STD-40-005 version 2-1 (in place and largely unchanged since 2007) to version 3-1 is fully underway everywhere. Certification Bodies (CB’s) are actively updating their protocols and training their auditors. Certified companies are coming to grips with the decision to either adapt and accept the new standard or drop out of the program. We don’t have a good estimate for the latter group, but anecdotal evidence suggests it may approach 50%. When MixedWood last wrote about this subject in November, we called it “a sorry mess”. We are sad to report that this description still applies. As expected, the 30 June 2017 expiration date was extended to 31 December 2017. And version 3-0 was replaced by version 3-1. But otherwise the transition process remains as we described then. At the heart of FSC’s Controlled Wood standard lies a requirement for certified companies to assess the risk that their procurement of non-certified wood might violate the ethical standards of the FSC program. This assessment is recorded in a publicly-available document called (unsurprisingly) a Controlled Wood Risk Assessment (CWRA). MixedWood took a critical and comparative look as CWRA’s almost 2 years ago with a post cleverly titled “Risky Business for FSC CW”. Our thesis was simple: the FSC requirements for CWRA’s was and is poorly defined and understood. As a result, the variation and inconsistency among published documents has become so great as to make the entire process rather meaningless. The transition to FSC CW version 3 was intended to resolve this problem by replacing individual company risk assessments with country-wide National Risk Assessments (NRA), developed and maintained by the FSC National Affiliates around the world. Here is North America, that means FSC-US and FSC-Canada. In theory, the NRA would be developed collaboratively within the stakeholder community and reflect a practical consensus position that all certified companies could happily adopt and utilize. It’s a good idea, but unfortunately has proved a bit difficult to execute. Take another look at the HCV definition, imagine yourself in the role of a log buyer for a medium-sized sawmill, and ask yourself this simple question: What exactly does this mean to me? Now you understand the problem. b) “avoid(ance of) timber from forests where HCV’s are being threatened at the ecoregional level”. In our experience, no one really knows what this means either. In the first place, FSC does not provide us with a definition of the term ecoregion. Other organizations have, of course. 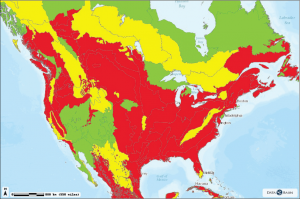 Most notably (for North America) the US Forest Service and the World Wildlife Fund. There is even a fairly good Wikipedia page on the subject. From all this we can conclude the ecoregions are broad geographic areas, defined by collections of generally similar traits, and extending over very large and diverse landscapes. Let’s return to the perspective of our log buyer. How is she supposed to identify a threat to a High Conservation Value that is being threatened by forest management activities at an ecoregional level? The answer, of course, is that, for all practical purposes, she can’t. We asked this, and similar questions back in 2006 when version 2 of the Controlled Wood standard was originally implemented, and we were able to find some practical answers. For wood buyers across North America, we accepted that the risk of violating basic ethical standards (the 5 FSC CW Categories) in the US and Canada was very low. This took the form of an informal, industry-wide consensus that remains in place to this day. That consensus allowed the development of a commercially practical market for FSC products in North America over 10 years ago, and remains essential today. Oddly enough, the disruption of the CWRA consensus is not a result of the transition to CW version 3. It has been in the works for some time. Accreditation Services International (ASI) is FSC’s internal accreditation body charged with monitoring and supervising Certification Bodies. They produced an analysis on HCV Risk Assessment in October 2014. Focused on Canada, it’s details and conclusions apply equally to the USA as well. The analysis is quite eye-opening. It exhaustively points out the many unclear and inconsistent details of the FSC requirements, and describes their consequences – as observed in the CWRA documents they reviewed for their study. Another example of the eroding consensus has been the FSC-US effort to produce a National Risk Assessment (NRA). You can read all about the effort here. A detailed draft was released for public review in early 2015, and is still available for download. It was supported by some very good staff work and includes a lot of rigorous and well-documented analysis. As a practical standard, however, it proved entirely unworkable. FSC-US staff, supported by a small Technical Advisory Group, are again hard at work on the NRA with the intention of producing a result in time for the stated deadline of 31 December 2017. Until last week, we were expecting to see a discussion draft sometime this spring. We just learned, however, that the project has run into problems again. They are presently seeking approval from the FSC-US Board of Directors to “explore a newly proposed alternative approach to the NRA”. We have been offered some hints in confidence about what this means in practice, and will update when we are able. Details are in this Update provided by FSC-US last week. One thing that is very clear: FSC-US are very unlikely to meet the 31 December 2017 for the NRA, which makes the next issue much more important. As we noted above, ASI has been working on this “problem” for several years. Until recently, their efforts have been limited to challenging the audit conclusions of individual CB’s whose interpretation of the CWRA requirements were seen to be inconsistent or incorrect. 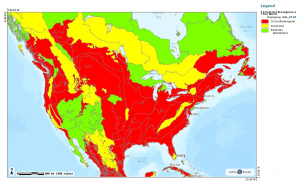 Last month, however, they took a very unusual action by releasing a paper entitled: Evaluation of FSC Controlled Wood Risk Assessments in Canada. (The linked copy includes some annotations by MixedWood). 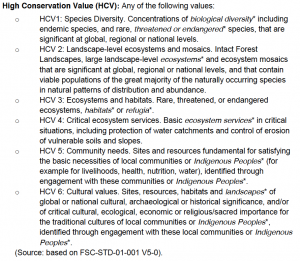 The paper outlines an interpretation of the FSC requirements for CW Risk Assessments for Category 3: HCV’s in Canada. They cite specific clauses of STD-40-005, as well as an Advice Note intended to clarify the standard, and an Interpretation intended to better define the Advice Note. Unfortunately, they also go one step further and provide their own unique interpretation and draw specific conclusions about why (in their view) CB’s are not correctly following FSC requirements. In this last action, ASI steps outside their proper role. 40-005, Annex A, Clause 3.1 requires assessment of the risk of threats at the ecoregional level. Interpretation-40-005_15 specifies that “information about threatened ecoregions…should be taken into account.”. The World Wildlife Fund (WWF) has an online resource called “Wildfinder” which includes descriptions of ecoregions around the world, including conservation priorities, and threats. One of WWF’s threat categories is “critical/endangered”. 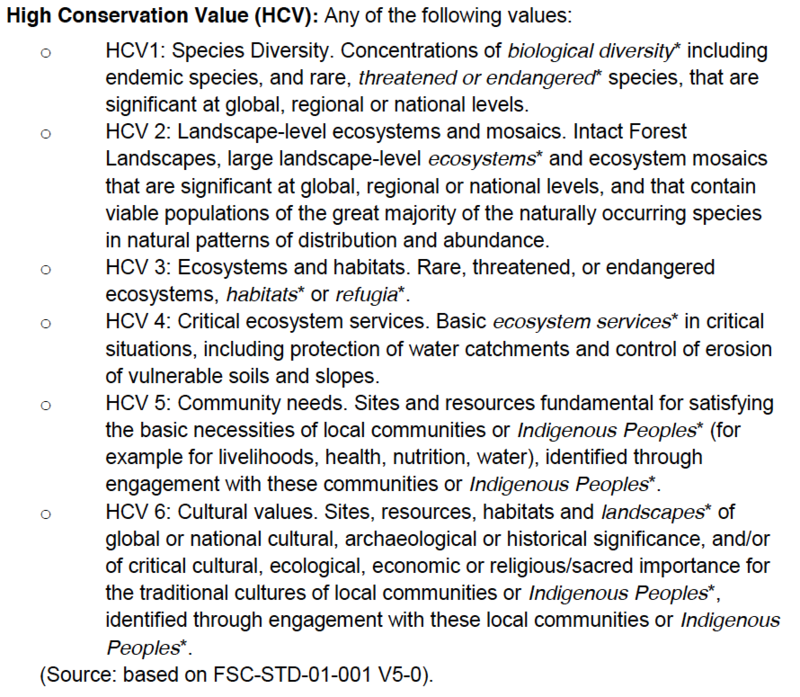 According to ASI, any ecoregion that is rated “critical/endangered” by WWF must contain ecoregionally significant HCVs. We believe this logic is flawed. More importantly, it is entirely inappropriate for ASI to make this kind of conclusion and still more inappropriate for them to compel CB’s (and ultimately certified companies) to conform to their logic. To understand why this is so important, take a look at the map below. It depicts the ecoregion identifications from the WWF Wildfinder program. They are color-coded by risk, with the “critical/endangered” areas shown in red. If we follow the ASI evaluation strictly, there is only one conclusion: every CW-certified company in North America is in violation of the FSC requirements and should stop doing business immediately. In practice, of course, it will not as dramatic as that. But we do have some work to do. The “sorry mess” that we call the FSC Controlled Wood program is largely the work of a small group of very hard-working, highly educated, well-intentioned, earnest professionals who are trying hard to make the world a better place. Their great failing – in our view – is their persistent inability to seek out, listen to, and incorporate the other group of equally hard-working, not-quite-as-well-educated, etc. professionals who do the daily work of making the FSC marketplace work. Controlled Wood is the area where FSC’s long-standing habit of creating ever more complex solutions to ever more complex challenges is becoming poisonous. It is also the place where taking a step toward simplicity will pay the biggest dividend. Changing direction will be challenging, but we may have reached a point where there is no other way.